With China’s development of the "Belt and Road”, the surge in cross-border investment and business growth is anticipated. The accompanying commercial disputes thus increases, so does enterprises’ demand for cross-border mediation services. On the other hand, the Supreme People’s Court is also actively promoting the reform of Diversified Dispute Resolution Mechanism. Having been highly recommended by the Chinese Government, the tendency of adopting the Diversified Dispute Resolution Mechanism is expected in the Mainland. The cross-border dispute resolution services provided by International Dispute Resolution and Risk Management Institute (IDRRMI) combine the strengths of both international mediation and arbitration, so that the arbitral award can be applied and executed in more than 150 regions all over the world. The parties need not file the same litigation repeatedly in different jurisdictions. Mediation does not only save time and money, but it also helps enterprises maintain their reputations and partnerships. Therefore, mediation is advantageous and irreplaceable in terms of autonomy, confidentiality, compatibility and flexibility, etc. Catering to demand of enterprises for cross-border/ international dispute resolution service, this advanced professional training course seeks to promote the use of dispute resolution in businesses and facilitate the development of the Greater Bay Area, Belt and Road Initiative and the internationalization of Chinese enterprises. This course will train mediation professionals who are familiar with international law. Given the high demand for international law and dispute resolution experts in China, students with successfully accredited accreditation are expected to be leaders in the field. This course mainly teaches mediation concepts, procedures, skills and related legal knowledge of the Mainland and Hong Kong through a range of interactive in-class activities, such as group discussions, real cases sharing and simulated cases (role play) exercises, etc. so that students can master all kinds of mediation skills in order to become a professional mediator. Students can also enhance their personal communication abilities and improve their interpersonal skills, effectively utilizing different mediation skills in dealing with disputes and conflicts in daily life and at work, in an organized and systematic manner. AIDRN is a global academic institute that offers training, defines competency standards, and conducts researches and data analysis for dispute resolution and negotiation. 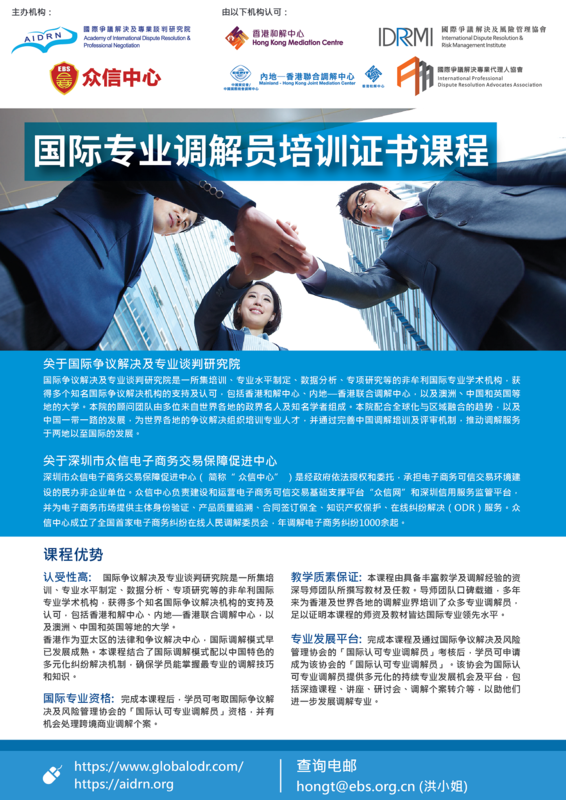 AIDRN receives support and recognition from prominent dispute resolution organizations such as Hong Kong Mediation Centre, Mainland-Hong Kong Joint Mediation Center and universities in Australia, China and the United Kingdom. As a center for legal services and dispute resolution in the Asia Pacific Region, Hong Kong has already had a mature development in the international mode of mediation. This course combines the international mode of mediation and Diversified Dispute Resolution Mechanism with Chinese characteristics, to equip students with the most professional mediation skills and knowledge, so as to deal with various international commercial disputes. Upon completion of this Course, graduates can apply for the Professional Mediator Accreditation Assessment organized by IDRRMI and will have the opportunities to handle cross-border/international commercial mediation cases. A team of experienced instructors is responsible for preparing the teaching materials and teaching this course. The reputable teaching team has trained up many professional mediators in Hong Kong and around the world, indicating that the teaching team and teaching materials are up to international professional standards. Upon successful completion of this course and the accreditation assessment organized by IDRRMI, students can apply to become the International Accredited Professional Mediator of IDRRMI. IDRRMI provides diversified continuing professional development opportunities and platform to International Accredited Professional Mediators, including advanced courses, talks, seminars, mediation, case referrals, etc., in order to help them further develop their mediation profession. Students attaining 100% attendance in the course and passing the examination at the end of the course will be awarded an "International Professional Mediator Training Certificate”. Students with the "International Professional Mediator Training Certificate” can apply for Professional Mediator Accreditation Assessment organized by IDRRMI. Candidates who successfully pass the assessment can apply to become the International Accredited Professional Mediator of IDRRMI. 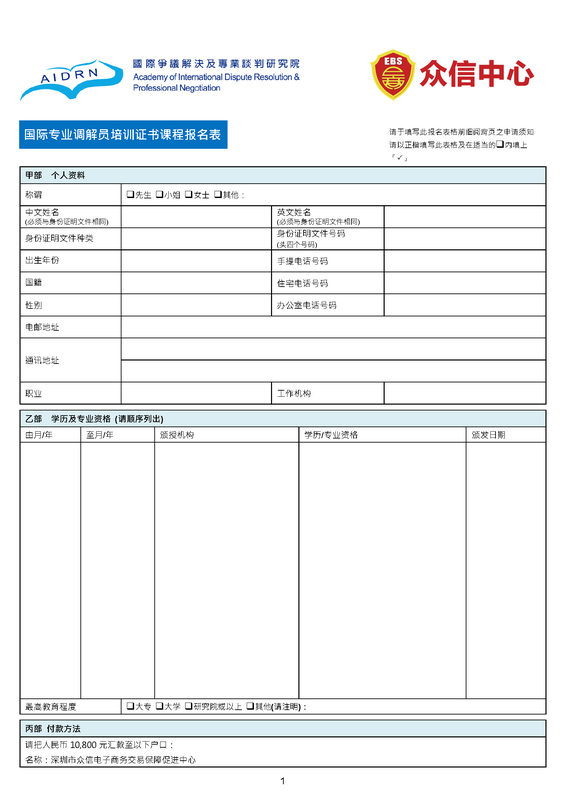 Application Method Please fill in and submit the application form, with the copy of academic qualifications, to hongt@ebs.org.cn. Eligibility Tertiary education level or above. Students are required to submit a copy of their academic qualifications at the time of enrollment.